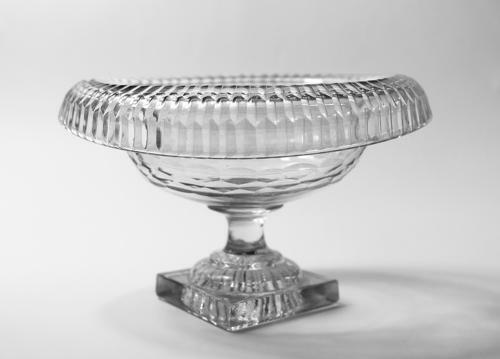 Small bowl with turnover rim with bands of mitre cut flutes and three rows of cut brickwork to the body. The bowl set on a short plain stem and square lemon squeezer foot. Irish C1800. Diameter to far edge of turnover rim: 20.5 cm. Width to far edge of turnover rim: 15.3 cm. Condition: Excellent condition with no chips, cracks or restoration. The foot has the original moulded finish on all four sides. Note: An fine example of a small Irish turnover bowl in excellent condition.